Labor isn’t at a crossroads, it’s on a cross. For the movement to be reborn it must stop pouring money into electoral politics and return to its roots. In a major blow to workers’ rights and economic equality, Wisconsin governor and top-tier presidential contender Scott Walker signed a right-to-work bill into law last month, making the proud, industrial Midwest cheese state the 25th in the country to prohibit workers from signing union security agreements with employers. The new law is almost certain to significantly weaken private-sector unions just four years after Walker succeeded in eliminating collective bargaining rights for most public sector workers in the state. The development also positions Wisconsin as a state leader in austerity, as Gov. Walker has combined his assault on organized labor with over $2 billion in tax cuts for big corporations and the super-rich, as well as a budget to cut $300 million from the University of Wisconsin education system. The victory for Walker and his corporate backers like the Koch Brothers and ALEC is sure to encourage more union-busting efforts in states across the country. It’s not hard to imagine a Republican president, maybe even Walker himself, signing a national right-to-work law in 2017 if given the opportunity. All of this matters because, despite its flaws, organized labor is the most powerful democratic force in American history. Fewer labor unions means more income inequality, and everyday people and hardworking families are sitting ducks to the corporate agenda without the effective counter-weight of a strong labor movement. That’s why it is imperative that organized labor heed the lessons of Wisconsin, soberly analyze the outcome, and draw the right conclusions from the fight in order to inform the movement’s next steps. The most important lesson to be learned from Wisconsin is that labor’s traditional electoral program is no longer effective, if it ever was. Labor and other allied groups spent tens of millions of dollars in the 2012 recall election and again in 2014 in an attempt to oust Walker, but their spending was still dwarfed by big money corporate interest groups. Even worse was the missed opportunity cost: Labor wasted four years telling everyday Wisconsinites to elect moderate, pro-business Democrats instead of stoking the flames of a historic uprising and working to pull off a general strike. They should have used all that time and money to educate and mobilize the working class instead, to train them how to solve their own problems through organizing and collective action. Although it’s difficult to accurately track election spending, particularly in the post-Citizens United era of super PACs and dark money, some labor leaders predicted ahead of the 2014 elections that unions would spend more than $300 million in nationwide races, as they did four years earlier. In 2012, labor spent $600 million on state and federal races, compared to $9.5 billion from big corporations. The Koch Brothers alone spent more than the top 10 labor unions combined in 2012. Unions won’t have to fully disclose all their 2014 election spending until October 2015 when federal reports are due. But, according to the Center for Responsive Politics, the National Education Association spent nearly $30 million in direct candidate campaign contributions in 2014. SEIU spent close to $24 million, the American Federation of Teachers spent nearly $20 million, and other unions like AFSCME, the AFL-CIO, the Laborers, and many others all spent millions more. Unions also donated millions of dollars to liberal super PACs. These forms of election spending by labor unions don’t include millions of additional dollars spent on direct member education, which is generally seen as a far more effective form of election work than campaign contributions to Democrats. What did unions get in return for throwing all of this money at Democrats in 2014? Next to nothing, as Republicans took control of the U.S. Senate and made significant in-roads across the electoral map at all levels of government. Wisconsin’s union-busting governor is now rivaling Jeb Bush in popularity in right-wing presidential circles after winning three elections in four years. The years that Democrats have won big in elections — think 2006, 2008 and 2012 — were because mass street protests changed the consciousness of millions of people and redefined what was possible. In 2006, Democrats gained control of both houses of Congress because of widespread anti-war sentiment, opposition to President George Bush’s proposal to privatize Social Security, and a massive backlash against draconian immigration reform that turned out millions of people into the streets on May 1, 2006. In 2008, President Obama won the White House largely as a result of the same sentiments and because the national economy had just crashed with a sitting Republican in office. In 2012, the Occupy Wall Street movement effectively changed the dominant public narrative away from budget deficits and toward income inequality, negating the Tea Party sweep in 2010 — itself a product of opposition to corporate health insurance reform — and giving Obama a platform to win a second-term. Mass movements dramatically changed the political landscape, while the usual game of inches played by the liberal “get out the vote” ground game in 2010 and 2014 failed to capture the public imagination and led to massive blow-outs across the country at all levels of government. But even in the years that Democrats did well, organized labor saw virtually no pro-worker legislation passed, or even seriously debated. The Employee Free Choice Act, or card check, stalled in the Democrat-controlled U.S. Senate in 2009 and was one of the first things President Obama dropped from his bully-pulpit agenda after taking office. Labor is now in a political dogfight with their alleged White House ally on free trade. This gloomy outlook on organized labor’s electoral program is reinforced by data compiled by Kim Moody in his groundbreaking 2007 book, “U.S. Labor in Trouble and Transition” which found that labor PACs spent between $100 and $200 million in every two-year election cycle between 1996 and 2004 and barely changed the makeup of Democrats in the House and Senate. During this same time period, no significant union priorities were passed while major setbacks such as NAFTA, welfare reform, and the repeal of the Glass-Steagall Act were all supported by many of the same Democrats labor had helped elect, including a president. The situation post-Citizens United is even worse, and it is absolutely imperative that organized labor stop seeing their election war chests as their strongest weapon to fight big money when workers’ ability to self-organize, go on strike, and shut down economic production is their only real source of power. If organized labor is to survive and regroup from the assault it is now under, union bosses must be willing to divest from the traditional electoral platform they are used to running and use the money to reinvest in building real people power in the workplace. This money — literally hundreds of millions of dollars every year — should be diverted instead to five key areas. 1. New Organizing. Although some critics have argued that labor should stop spending money on new organizing campaigns and instead focus on internal organizing, the truth is organizing has brought in 1.5 million new union members even as labor unions have lost 3.5 million more. New organizing drives will lead to more union density, which will help lead to more victories at the workplace and at the polls in the long run. 2. Internal Organizing. Strong labor unions can only be built from the bottom-up. At its best, this is done by training dozens of rank and file workers to become union stewards and active leaders in their union, including defending their co-workers on the job and organizing them into committees capable of taking action. As relationships are built and grievance and bargaining victories are won, more workers will see the value of the union and become active members in it. The problem is that even labor unions that claim rhetorically to put a high priority on internal organizing often don’t have the resources for it. Even the best paid organizers are often too overworked to prioritize leadership development in their bargaining units, particularly when election campaigns tend to always get in the way. Unions needs to start putting real money into training their own members to become activists and organizers. They could start by setting an ambitious goal to train 1.5 million new worksite leaders by the end of the year, as an initial step towards rebuilding powerful internal structures, networks, and committees to better facilitate the self-organization of the rank and file. 3. More Worker Centers. Worker Centers and other “alt-labor” groups are effective organizations often funded by unions to fill a niche that industrial labor is unable to handle on their own, particularly in black and immigrant communities. Many workers in the service sector without a union turn to Workers Centers when faced with wage theft or other exploitation on the job. These organizations often lead the Fight for $15 movement in cities across the country, and this model of organizing could expand greatly with more investment from unions. 4. Strike Schools. Reviving the strike is key to rebuilding the labor movement. But many labor unions have all but forgotten how to take effective action on the job, up to and including going on strike. According to the U.S. Department of Labor, in 2014, there were only 11 work stoppages involving more than 1,000 workers. In 1952, there were 470. In 1974, there were 424. This is a real problem because the decline in strike activity also closely mirrors a similar drop in union density. Organized workers barely make up 10 percent of the workforce today, half of the rate in the 1930s, and down from a historic high of nearly 35 percent in 1955. Furthermore, as Moody shows, periods of open labor revolt generally align with large growths in union membership. Strikes work, both to win concrete victories on the job and in the political arena, but also to electrify the working class into re-imagining what’s possible. Organized labor could start to turn these statistics around if they invested part of their election budget into “Strike School” programs to organize their bargaining units and prepare their members to go on strike. One of the best models out there was developed by SEIU 1021 in San Francisco and includes day-long presentations, videos and discussions on the theory and practice of how to prepare bargaining units to go on strike and win. 5. Civil Disobedience. Federal labor law has made it extremely difficult for unions to go on strike and engage in many other forms of protest, but that didn’t stop labor from organizing before it was legalized in 1933, and it shouldn’t stop them now either. Labor could begin training its members to take action on the job and either refuse to pay the fines and penalties that result from illegal strikes, or raid its campaign war chest for funds instead. None of this is to say that elections don’t matter, because they do. Elections have consequences, and the run-off primary between Rahm Emanuel and Chuy Garcia in the Chicago mayor’s race is a great example of how community organizing, bold strikes and alliance-building can feed into real election work. But Emanuel’s 10-point victory over Garcia on April 7 shows that the labor movement still has a long way to go before it has enough people power mobilized to take on big money and win. 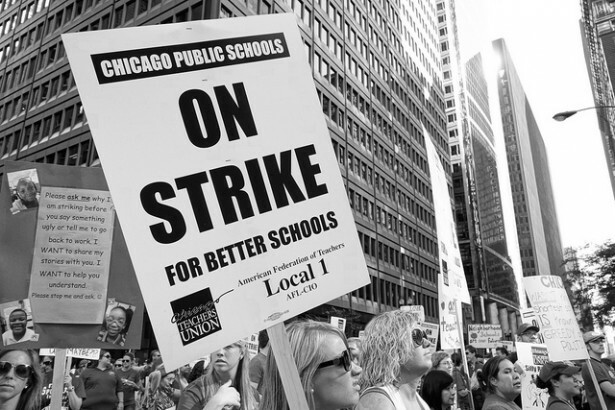 The grand lesson in all this is that good social movement organizing, whether the 2011 uprising in Wisconsin or the 2012 strike by Chicago teachers, is the way forward for the labor movement. Effective election work, when it happens at all, is spurred forward more by mass movements than by mass money. Even when labor sometimes wins elections, their failure to break with the Democratic Party, who is equally beholden to big business, undermines worker victories at the polls. At the end of the day, worker power is found on the job and in the streets, not in the campaign coffer. A fundamental strategic shift on this point is the only way forward for a crucified union movement to rise like a Phoenix from the ashes and start to truly fight back against corporate control. Mr. Goodner speaks of workers building from the ground up, this is the essential building block. If there is no connection between fellow workers, neighbors, citizens, then there certainly will be no organized help for labor. If money is the new weapon, and unions are out gunned, then unions had better make sure their aim is is on the mark to help create equality of pay for working American families. Grass roots, everyday training in organizing workers for their financial survival harkens to the beginnings of the unions formation, which worked, and is a point well made by Mr. Goodner. Yes, whether work is performed in voluntarism, as self-help, or for “the man”, the value of work is the people’s economic strength. BTW, the KP is using Walker as a crash dummy to shield Jebya. Prepare now for Walker to soon be consumed. We still need to remove enough KP apparatchiks in WI state legislature. Then, WI RTF can be repealed. Right To Be @!#!ed and Act 10 are laws, not state constitutional amendments. A big problem for labor unions and their members who go on strike is that by law the workers can be permanently replaced unless it is an Unfair Labor Practice strike. In other words, you risk losing your job by going on strike over working conditions, economic, or safety issues. This situation needs to change if there is ever going to be a level playing field for unions. Which is why the KP needs to maintain high unemployment. 1998 (late 1990s) was a KP error. When employment is high, the KSM cannot convince the people of “structural unemployment” — that some vague incurable failng of the people causes the perpetual national, social illness of permanent high un/under-employment.